This jacket initially caught my eye late last winter when I saw Polartec’s announcement about their insulating fabric, Thermal Pro High Loft. After about 15 days testing it, I can say I think it is exceptionally awesome. This fabric attacks the problem many insulators face: they’re either down or a synthetic-down copy. The problem with down and most synthetics is that since the individual fibers are so fine, they require “down-proof” fabrics to contain them. These down-proof fabrics are high-density nylon weaves that, while light, hardly breathe at all. Okay, the Radium isn’t exactly like that, but it’s fairly close. Compared to down, the Radium is heavier, substantially less wind resistant, and less packable. There are definitely some tradeoffs, which I’ll talk about in a bit. So is Polartec’s Thermal Pro going to change the way the world looks at insulation? Probably not. Does it add another excellent option to the market? Absolutely. One last note. Most of my comparisons in this review will be to more “modern” insulators (such as my Patagonia Nano Puff), as opposed to traditional fleece. 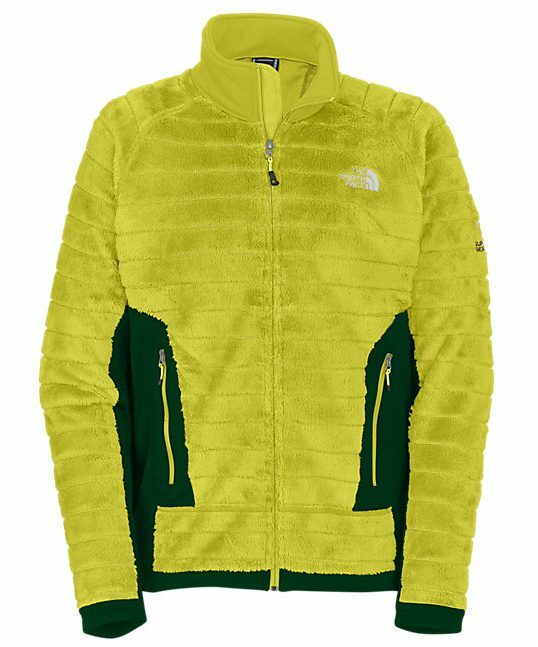 The Thermal Pro High Loft is very different from a typical fleece jacket (think Polartec Polar Fleece like The North Face Denali). Polartec Fleece is heavier, substantially less packable, and less breathable. I have never been a big Polar Fleece fan for these reasons. Thermal Pro High Loft, on the other hand, is warmer, more packable, and lighter. I got the “Firefly Green” jacket, which turns out to be more neon yellow than green. The Radium is also furry, like a yeti, and it has horizontal stripes across the torso and arms. It’s accented with forest green Power Fleece. If you’re not a fan of bright, loud jackets, the Radium comes in more subdued colors as well. And even though you might worry, like I did, that this jacket will leave your house covered in neon yellow fibers (as if you had a new long-haired cat that was spoon fed uranium as a kitten), the shedding is actually quite minimal. Similar to Polartec’s other new insulating fabric, Polartec Alpha, the Thermal Pro is a low-density fabric. This means most of the fabric is empty space. In fact, when you take a close look, it’s actually almost transparent. Imagine a piece of mesh with large holes and long fibers of fleece woven throughout it. The “mesh” acts like a scaffold for the fleece to sit on. Sam in The North Face Radium, Indian Creek, UT. A jacket with a low-density fabric woven into a mesh scaffold? Does that sound like it might breathe pretty well? It does. The Radium is one of the most breathable jackets I have ever worn. This jacket breathes as well, if not better, than a thin cotton T-shirt. Granted, this phenomenal breathability comes at a price. The Radium has almost zero wind resistance. The only places on the jacket with noticeable wind resistance are the panels of power fleece, so I hardly wore this jacket outside without a wind resistant layer over it. Even hiking on a still, cold day, I’d feel chilled because my swinging arms would generate enough wind to penetrate the jacket. I think the Radium and Nano Puff represent the active and non-active classes of insulators. The Nano Puff is lighter than the Radium, 100% windproof, and breathes poorly. The Radium is a bit heavier, wind-transparent, and breathes like it isn’t even there. 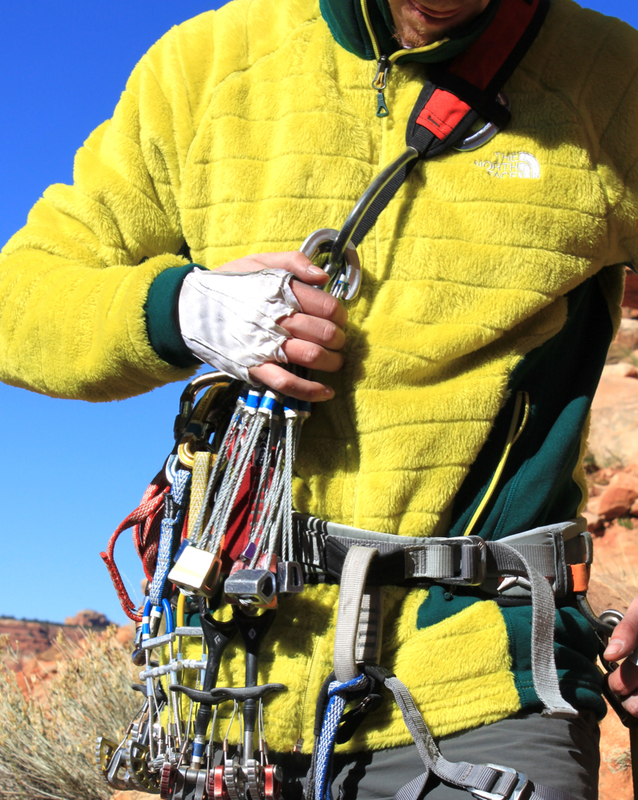 I wear my Nano Puff as an alpine belay jacket in the summer, and as a general warm outerlayer in dry conditions. I don’t wear it skiing, hiking or climbing, since it just doesn’t breathe well enough. The Radium is the exact opposite. I wear it skiing, hiking and climbing (although I nearly always wear a hardshell over it). I do not wear it to stay warm during sedentary activities. The Radium has a great fit for an active jacket. It is slim throughout the body (much more so than the Nano Puff) and cut long enough (27 inches) so that it can easily be tucked into a harness. The arms are cut long, meaning that your wrists and forearms will always be covered, even when you’re reaching for holds high above your head. The sleeves extend to the base of my fingers with my arms at my sides. The Power Stretch panels on the sides of the jacket allow the jacket to move easily with you, and the Thermal Pro itself has some stretch to it. Overall, the fit of this jacket is perfectly suited to complement the activities this jacket excels at. Compared to “standard” fleece jackets, I would say the Radium has longer arms and a longer torso, and it’s slightly slimmer in the body. Sam in the The North Face Radium, Indian Creek, Utah. It might be useful to point out that for any fleece, this is true. You can pick just about any fleece on the market, even $10 old navy fleeces, and as long as they aren’t marketed as ‘wind resistant’ or ‘wind proof’, they’ll breath as well as a cotton t-shirt, while providing warmth. But yes, the warmth it provides per weight while still giving full breathability is it’s key. It might be useful to note that having wind resistance in the locations where the Powerstretch is located is less than ideal. Having no wind resistance across the main body of the fabric, but having wind resistance underneath the arms and alongside the core, isn’t exactly ideal (to put it nicely). In fact, the exact opposite of this jacket fabric layout would be more ideal, in terms of warmth and breathability. It might also be worthwhile to note that Powerstretch is far from noticably wind resistant (if it’s similar to the powerstretch fabrics I’ve worn). It might turn a breeze into something imperceptible, but anything more than that, you’ll definitely be feeling. It’s important to note that this is only somewhat true, and only when dealing with jackets of similar insulation fill. What’s more important is the density of the insulation fill, especially when it comes to down. Total insulation weight of a garment is often more important. When comparing different insulation types, all bets are off. For example, synthetic fill can be a lot more efficient per thickness – thinsulate is designed as the most efficient in terms of thickness to weight (great for gloves and hats). Down is generally very inefficient when it comes to thickness vs. warmth, but is quite efficient in terms of weight vs. warmth. Most synthetic insulations are about as half efficient (if considering 800 down fill quality), but can be noticebly thinner per warmth, especially as the desired warmth increases. Of course, when bringing weight into the equation, they tend to lose points. Why would you choose this over an insulated hardshell? Having an insulated hardshell allows you to immediately bypass all insulation when ventilating, which can be quite useful. In other words, it might be worth stating when you found this type of jacket worth wearing, and when you found it not worth wearing (activities, environments, etc.). This aspect is missing from the review. In my experience, thick warm jackets without much wind resistance have very little utility. For example, when moving strenously, I can wear a highly breathable non-membrane softshell down to ridiculously cold temperatures. While a thin softshell has very limited insulative qualities, the ability for it to trap in warm air generated by one’s body allows it to be very useful to surprisingly low temperatures. 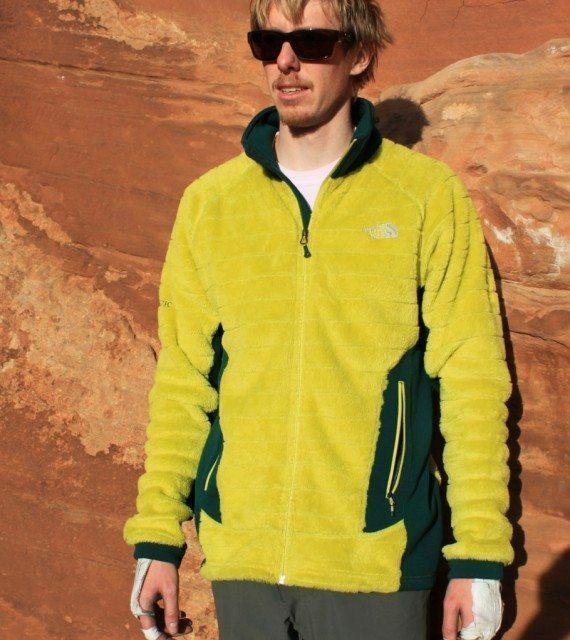 A jacket that is warm but traps very little airflow, such as a fleece, seems best used in static environments where the temperatures are quite cold. I can’t think of any, except, perhaps, in the shade while sitting around in a calm environment. Can you explain where you’ve found yourself in such situations, or other situations in which this type of material is best suited? I guess this is what happens when I have too much time on my hands… hah! Again, don’t take this the wrong way – it’s a great review, and covers most of what you’d want to know, but I think many would like to understand the answer to the question… When would you use this… and when would you not? I’d be looking at this question the other way around. Why would you want to use an insulated hardshell, when a warm fleecy midlayer plus a hard/soft/windshell of your choice is cheaper, more versatile, and perhaps even longer lasting? Dries more quickly and probably holds less water when wet, too. Hey Brian, thanks for your comments! I do agree with most of your points, however, on the insulated hardshell front I’m going to have to agree with Ru. 1) The breathability of fleece in general is very good. However, the thicker and more dense the fleece is, the greater vapor barrier it will provide. The Thermal Pro High Loft is very low density and relatively thick which makes it far more breathable than a traditional fleece with similar warmth. 2) You are very correct in stating that loft does not necessarily correlate directly to warmth. That however, is a bit out of the scope here. Hopefully I haven’t confused anyone by my wording above… As a comparison to similar (and competing) jackets, I think loft thickness is a great metric to go off of. 3) Insulated hardshells… Oh man, I really don’t like insulated hardshells. Of course, it is all a matter of personal preference. For me however, the versatility of a separate shell and insulation makes it an easy choice to stay away from insulated hardshells. Agree to disagree! I know there are a lot of great insulated hardshells on the market that work for all sorts of activities but for me they aren’t the best. 4) As far as activities and environments, I wear this jacket doing just about anything active. I’ve been wearing it skiing (both touring and resort) a lot recently. I also wore it often this summer on early morning climbing approaches when it’s very cold and calm (often even without a shell). I also find myself wearing it around my house when it gets cold out… I wear the jacket all the time! Thanks again for your comments, it’s great to hear back from readers, I think a lot of the points you made are very valid and I’m glad you brought them up! How does the Radium compare to Patagonia’s R2 jacket? They seem very similar. Other than that, the R2 appears to be a bit thinner judging by the pictures and the weight (R2 = 391g, Radium = 439g). Overall I think both jackets are aiming for similar market space. I wish I could help you out more! The more apt comparison would probably the Patagonia R3 vs the R2. Both the R3 and the Radium primarily make use of Polartec Thermal Pro. The Patagonia’s panels are Polartec Power Dry, TNF’s are Polartec Powerstretch Pro; Sam might be able to comment on the differences between these two as I have no idea (as Jed said in his review of the Lethal Descent Eagle: Sam is an “overall outerwear savant “). Anyways, average weight is nearly identical (R3 = 445g, Radium = 439g), as is price. Been waffling between these two actually. Given both of these jackets are really easy to find in retail settings, I just need to try both on – my experience is that fit is different enough not just between brands, but also between lines and individual pieces, that which one fits me better may be the deciding factor. Sam, would this jacket combined with a Gore-tex Active shell be enough protection in windy conditions at -15C or colder (given a good base layer, of course)? Or would I need to go to a more protective shell, maybe Gore-tex Pro? Your question is not an easy one to answer. It depends on a lot of things – mainly the level of activity you are doing. In a high output activity, that would easily be enough. In sedentary conditions, it probably isn’t enough. The decision between Active Shell or Pro should be more based on activity too. Pro is heavier, slightly more breathable and a bit more durable. It also tends to be more expensive. A lot of that decision is based on what you will be doing. Resort skiing and side country? Pro. Touring or cross country? Active. Alpine climbing/mountaineering? Pro. Hiking/Trekking? Active. Thanks Sam, I should’ve been more specific. Let’s say resort/sidecountry, with 15-minute lift rides in strong winds at -15C, some short hiking and/or traversing. And of course you’ve nothing more important to do than respond to me!! Seriously, you and everyone else at Blister are the greatest for all the help you provide. That’s the hardest thing in the world to layer for! But I do think the Radium would be a good layering piece for those conditions. I would pair it with a heavier base layer (think Patagonia R1 or similar) and a solid 3L shell (Gore Pro is better choice than active, but NeoShell would also be a good option). If you tend to run cold, the Radium won’t be enough. At -15C (5F for us americans) I would tend to gravitate more toward down and synthetic baffled insulation. I know at that temp, if I’m skiing resort, I won’t be sweating too much so the decreased breathability from down/synthetic isn’t a huge deal. For me, the Radium is ideal for -12-10C (~10-15F) conditions with high output like touring. If it gets colder than that, you may need another layer. In -15C touring, I wear the Radium on the way up and then typically throw my Montbell Alpine Light down jacket over my shell when I stop moving to retain heat. I hope that helps! Layering is a tricky thing because it is very individual and conditions dependent. Let me know if you have other questions!